This pack is a really great idea! I never wanted to deviate too far from vanilla, so I used Vattic's Faithful, but I found myself having to add the occasional textue from other packs (for personal use, of course) to remove the ugliness that Vattic was merely replicating. So I look forward to this pack becoming more complete. You're getting the detail and quality of 64x64 textures into 32x32. OK, you added 27 textures. I will download now. How did you settle on Lithos? Why do I remember posting on this before? Did you have a different topic for Lucid before changing the name? Doesn't really matter, I can't say enough how amazing this is! For a Faithful pack, this is the best take on it I have seen, ever, by anyone, by far. I always found Vattic's Faithful to be the extent of the style, but this! I had no idea the default textures could be upgraded to look this good and still be resemblant of the originals! Honestly, in my personal opinion, this is much, much better than Vattic's Faithful. No offence to Vattic, his pack does a good job, but it is just trying too much to look like the default. This is truly what a Faithful pack should be. Vattic just smoothed edges and added Anti-aliasing here and there, but you have completely transformed the default textures into much better, realistic versions. That is what one should do with a 32x32 Faithful pack, not just smooth the edges, but refine the texture, and do what 16x16 packs can't do. This, you have done. Just amazing! I hope this pack takes off, because I would honestly be upset and disappointed to see a pack like this get dropped back and not noticed. This deserves to be up with Vattic's Faithful, and I think it should be even more popular, but that's me. I hope you can stick with this! Even if this thread doesn't receive as much feedback as Vattic's Faithful, keep it updated, for all of our sakes! Still appreciating the positive comments, especially the long post by corner_g. But constructive criticism is also welcome. I'm not sure exactly why, there are some really amazing non-faithful texture packs out there, but i also prefer to stick close(ish) to the canonical concepts for textures-- except when they bug me too much (glass streaks, for instance). Also as an artist i tend to do better within boundaries. The infinite possibilities of a blank canvas can leave me spinning my wheels, without accomplishing much. I compiled 20-30 names that sounded cool, and or had some meaning associated with my intended style. I used a thesaurus for some of this. Then I checked to see if any where already in use (as i should have from the start). None of them were. Then i chose the name that had the best combination of brevity, ease of spelling, pronouncing, and memorability, and relavance. "Lithos" means "stone" in greek, and was better than most other options on all other counts. Also it sounded sorta similar to "Lucid". I don't know i could have sworn that you had already commented on my pack. I definitely recognize your avatar. Weird. I started this thread in texture discussion asking if there were any existing texture packs that fulfilled the Lithos' goals, but you aren't in that thread. I hope you can stick with this! Even if this thread doesn't receive as much feedback as Vattic's Faithful, keep it updated, for all of our sakes! I've been playing MC for a long time, and only seem to get tired of it temporarily. And as long as i'm playing it, i'll want to modify it, which for me means textures. The big question is weather i can make progress faster than Mojang adds new content! Realistically i won't keep this pace continuously, but this hobby will take turns with others for center stage. I'm a freelance artist, and while i don't expect texture-pack making to be a viable way to make a living, the further away from "doing my job for free" adfly gets me, the less i'll feel bad about the time i'm taking away from stuff that's paying the bills, and thus the faster Lithos will get done. So far i've earned far, far less that 1 cent an hour so, that part may not be relevant. I have to disagree. Vattic absolutely didn't smooth edges and add anti-aliasing -- in fact he did the opposite -- he redrew every texture from scratch and maintained a hard-edged pixellated look. This is the texture pack that aims for a smoother, anti-aliased look, which is a good idea. I look forward to seeing this texture become a "smooth" alternative to Faithful 32x32. I can give some constructive criticism (although it's just my personal opinion). - I don't like the redstone ore, it's too different. 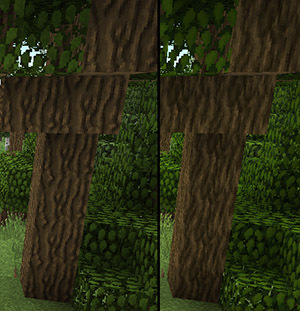 - Tree wood has a great level of detail, but doesn't look as much like wood as Vattic's textures. keep it up! Probably the hardest part will be the mobs. So, can anybody recommend texture packs i can look to for inspiration that has practical looking armor that also reveals a good amount of the player's skin? I'm seriously considering making each ore unique, but i've only done redstone so far. However, i want Lithos to be useable in a big mod package like FTB, so recognizing the ores by sight is important. I haven't figured out if both of these are compatible-- probably redstone is too much of a departure from vanilla. Noted. I think i'll focus on completing all the blocks, first, but those textures do need a revision. I don't think it matters. The texture works, and i'll probably change dirt anyway. You mean the log end? That texture is probably the one that Vattic and I have done most similarly. Sorry, i'm not very happy with the creeper face, but the jack 'o lantern is one of the few places were i can go a different way without violating my three goals in the OP, so i'll do something different. I can't imagine a flavor for grey jelly beans that i'd want to think about while playing MC! Anyway, I've just got done screencapping a bunch of varied shots that compare Default, Faithful 32x32 and Lithos. If I can find a good way to use them to demonstrate a comparison, I'll show the results! I suppose it depends on what kind of tree is normative for your. But, you've made me see it with new eyes-- i think it needs a major revision -- though i don't know that it will end up looking more like vattic's. It's too wavy, and vertical. I'm especially interested in comparisons between Default and Lithos when the lack of faithfulness negatively impacts a build. I mostly do comparisons between mine an Default on the single texture level. There are so many ways blocks might be used that i can't see and compare them all. Coming up next. All the Rails, some Quartz, Vines, and maybe wool. 30 new assorted block textures. v0.3.1 includes all Wool, all Rails, some Quartz, Vines and Red Small Mushrooms. There's always a tension between quality and quantity. Since a very incomplete pack is of minimal use, i'm turning the dial further to "quantity". A lot of blocks will be redone at a later date. WOW that's awesome better then Vattic's faithful !!!!! Thanks. There wouldn't be much point in producing yet another pack, if i couldn't bring something new or better to the community. Of course, Vattic still has a huge edge in completeness and mod support. I've added all the Giant Mushrooms blocks and Mycelium, which i think turned out well. 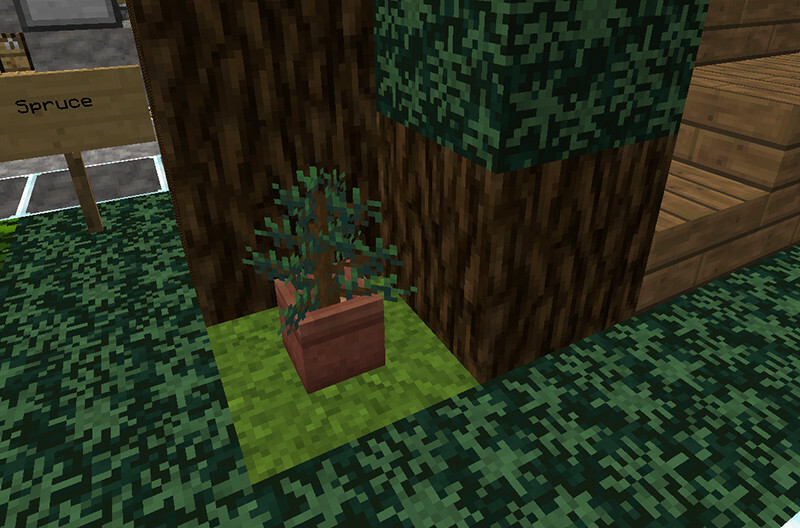 Birch and Oak leaves now have different shapes, and i added the wooden door and spruce sapling. I'm also adding some rough GUI elements. June was the first full moth since i made Lithos available, and i'll mark that by including some basic stats in the OP. The end of June saw Lithos squeak past 1000 downloads -- so thanks to all of you. I was nervous at the mention of Argon, afraid that another 32x faithful pack might mean i was trying to do what was already done, but, as you say, rather we're going different directions, so that's good. I've had trouble settling on the style for my items, but mostly i've ignored them and worked on blocks instead. Wonderful! It is already a usable WIP and im using it!! When you get the textures done then you should probably add sounds.